Advanced diagnostics, individualized care and a passion for delivering the highest quality in heart and heart rhythm treatment. With offices in three convenient locations in San Jose, we are in your neighborhood. Dr. Chow provides comprehensive patient services in both general cardiology and electrophysiology (heart rhythm disorders). General cardiology services include consultation and patient management, stress testing, echo, vascular ultrasound, ECG and heart rhythm monitoring, and more. Cardiac electrophysiology services include pacemaker and ICD implantation, electrophysiology studies, and catheter ablation–including atrial fibrillation ablation. Dr. Chow also provides services in his outpatient device management clinic, incorporating remote (at home) pacemaker and ICD follow-up. If you are seeking cardiac care or have questions, please request an appointment today. We strive to provide the most current treatment options for patients in cardiology and electrophysiology. Read more about Dr. Chow’s education, professional background and his curriculum vitae. We currently operate out of three convenient locations in the San Jose California area. 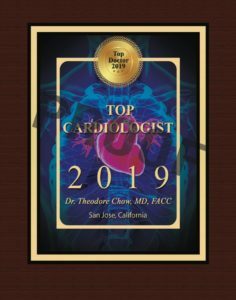 Dr. Chow is ABIM Board Certified in Cardiovascular Diseases and Clinical Cardiac Electrophysiology, and a fellow of the American College of Cardiology. In today’s fast changing and technologically advanced medical environment, Dr. Chow’s training and experience allow the highest standard of care for patients. We strive to provide the most current treatment options for patients in cardiology and electrophysiology, and a personal compassionate approach to patient care. Treadmill stress testing, Nuclear imaging, Cardiac ECHO, Holter / Event monitor, Mobile home telemetry, Mobile home CHF monitoring, Pacemaker follow-up and more. Electrophysiology Study, Pacemaker / ICD implant, Loop recorder implant, Cardiac resynchronization, Tilt table test, Catheter ablation of: SVT, VT, PVCs, and more. Our coumadin clinic involves convenient office based checking of a patient’s coumadin level, with on-the-spot physician recommendation as to repeat testing and follow-up. We follow pacemakers, ICDs and implantable loop recorders using a combination of in-office device checks and remote homemonitoring to easily track your health. If you require cardiology or electrophysiology services, we are here to serve you, with three convenient locations in San Jose. Weekend appointments may also be available (by appointment).